Book Cathay Pacific Flights using Aeroplan miles! Air Canada, a Star Alliance member, and Cathay Pacific, a oneworld member, have recently become partners on select routes to/from North America and Asia. As the two airlines are now partners, select frequent flyer benefits are also available to passengers. You can redeem Air Canada Aeroplan miles (a transfer partner of American Express Membership Rewards) for select flights on Cathay Pacific within Asia. Best of all, little to no fuel surcharges are imposed on Cathay Pacific. The above 8 destinations operated by Cathay Pacific or Cathay Dragon can be booked using Aeroplan miles, only in Economy or Business Class. Cathay doesn’t operate First Class on the above routes. You also cannot book Cathay Pacific Premium Economy Class using Aeroplan miles. The awesome thing is you can combine Cathay flights with all other Air Canada/Aeroplan partner airlines. For example, you can fly Vancouver to Hong Kong on Air Canada and then Hong Kong to Bangkok on Cathay Pacific on one ticket. 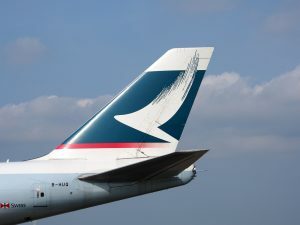 You can mix any other partner airline with Cathay, no problem. All other Aeroplan rules apply – just as you would be booking any other Star Alliance ticket through Aeroplan. Keep in mind, Aeroplan has generous routing rules – you can have up to 2 stopovers (in addition to your destination) on a round-trip award ticket. You can’t book Cathay Pacific/Dragon on Aeroplan’s website, so you will need to call Aeroplan to book your desired flights. Keep in mind, Aeroplan has a $30 CAD telephone booking fee that is not waived even if you can’t book online. The best way to find award space on Cathay Pacific/Dragon on one of the above 8 routes to/from Hong Kong, is to use the British Airways Executive Club website. The award space you find there should match what Aeroplan agents can see. However, keep in mind if there are 1-2 seats left on a certain flight, Aeroplan might not be able to see it – this is because Cathay Pacific offers less award seats to non-oneworld partner airlines (like Air Canada and Alaska Airlines). Booking Cathay Pacific/Dragon flights in addition to other Star Alliance partners on one ticket through Aeroplan is a great deal. This is because Aeroplan is an instant transfer partner with American Express Membership Rewards and also doesn’t charge fuel surcharges on a number of airlines, making lots of redemptions a great use of your miles.